Most people’s attention might be on the iPad 2 (s aapl) launching tomorrow, but iOS 4.3 brought some impressive improvements to existing hardware, too. 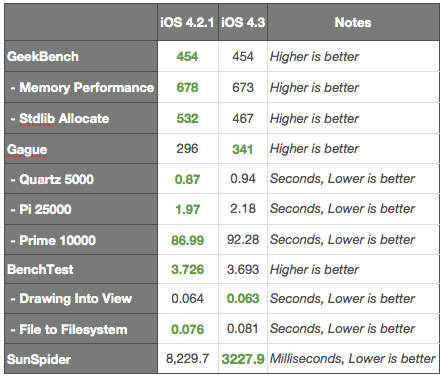 I followed the same testing I’ve used when benchmarking updates before, only this time I applied it to the iPad. On both devices, I cleared all running apps from the multitasking menu and powered off then back on the device to ensure the there were no background tasks running to interfere with test results. The only concern I had was that the benchmark apps were all iPhone apps, not true iPad apps, but it shouldn’t affect the overall results. I used GeekBench 2 ($0.99), Gauge Mathematical Tool (free), BenchTest ($0.99), SunSpider (free) and V8 (free) to test the performance of each OS version on the iPad. I performed all the tests on the same device, both before and after the upgrade. For what you get in the form of features withe the iOS 4.3 update, and for the almost insignificant general performance hit on the iPad, the upgrade is overall a great one. 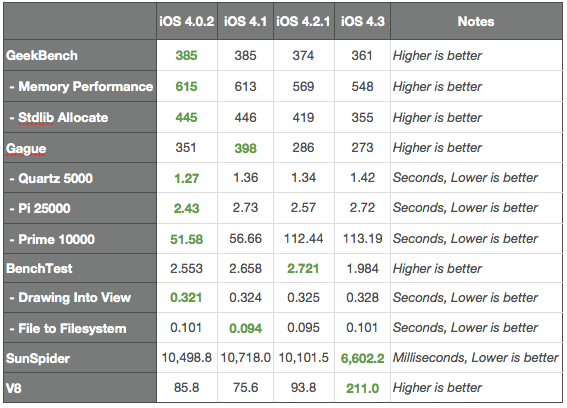 Any time you get more features for little or no degradation in performance is a good thing. I like the new update but it broke my pictures, i have a folder of 1.3 gig pics and my iPhone 4 thats has 9 gig free space say that i dont have enough space. Anyone know how to fix it? If so plz tell me, pictures are what i use my iPhone for the most. Thank u.
I got much better results with my iPhone 4 on SunSpider. Total of 2.35% better performance running Java. Every time you add more features you will have degradation, specially on the platform such as iOS, where whole system is run large framework that sits on the lightweight OS. Question is how much optimization they did afterwords. Every new optimization is more expensive since it is more complex, and than when optimization became to expensive and hardware became to slow under all new software upgrades, Apple release a new hardware version :). stupid question, but i just got my iphone 4. how do you kill apps from the multitasking menu? nevermind… i figured it out. im an idiot.